The name Admiral’s Pennant was inspired by the writings of Herman Melville. He penned “admirals pennant” in his book White Jacket, as a descriptive term for an impressive beard. White Jacket was inspired by Melville’s time in the US Navy aboard the U.S. Frigate United States in 1843. The owner/CEO of Admiral’s Pennant LLC, Matt Amos, is a retired US Marine who served 10 years in the Marine Corps before being medically retired for injuries received in combat. Upon his retirement, he began to grow the traditional “Freedom Beard” as many servicemen do. He found a selection of beard oils on the market, but found that most of them were just too strong and fragranced for his skin. He began to research different oils and mixtures and found a blend ratio that is not irritating, not overpowering, and provides numerous benefits to his beard. Admiral’s Pennant uses only the finest carrier oils and essential oils available on the market. Each bottle is handmade, to the exact specifications required by Mr. Amos, (we do not mix large batches and then bottle it); it is then sealed in the amber containers, which are used specifically to maintain the integrity of the oils. As we continue to grow, we plan to add additional beard oil collections and blends, beard balms, beard and mustache waxes, shampoos, soaps and shaving accessories. No matter what we do, quality will always be the main focus. Thank you for your support of a Service Disabled Veteran Owned Small Business. 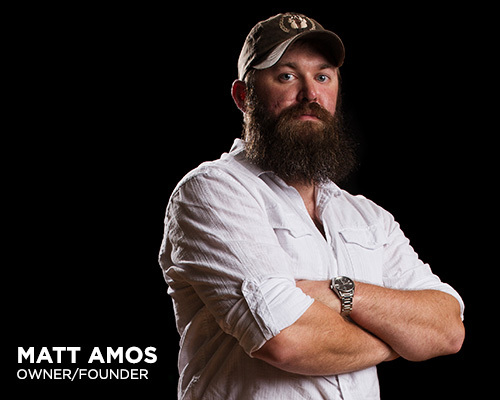 Matt Amos spent 10 years in the US Marine Corps. He was medically retired in 2013 after sustaining the loss of both of his legs in Sangin, Afghanistan in 2011. He spent two years in recovery at Naval Medical Center San Diego (Balboa), where he was able to rehab with some of the best corpsmen, nurses, physical therapists, and doctors around. He has been honored to serve in such battalions as 1st Bn 7th Marines, 24th Marine Regiment, and 1st Bn 5th Marines, where he served with the finest men and women our nation has to offer. He has also lost friends, who paid the ultimate sacrifice in the War on Terrorism. In honor of these fine men, he continues to press on – despite his injuries – with a positive attitude and a passion for serving others. His main goal is to live his life in a manner his Fallen Brothers would be proud of. Matt has been blessed to receive help from many organizations during his recovery and during his transition to civilian life. Without the help of these fantastic organizations, the dream of Admiral’s Pennant would never have become a reality. He is forever grateful to all of them for helping him and his family during their time of need. A list of these organizations is available on the “Charities” page of the website. In addition to Admiral’s Pennant, Matt volunteers with numerous veteran’s charities and organizations. He is passionate about helping service member’s transition smoothly into civilian lives as well as working to raise funds in order to help other wounded veterans receive the same opportunities he received.